A glow-in-the-dark paddle on the San Marcos River is a memorable way to enjoy this scenic Central Texas town. What are the ingredients for the perfect family getaway? Start with fun activities the whole family can enjoy, add some educational activities disguised as entertainment, and sprinkle in some outdoor adventure that will wear the kids out. Voilà, you’ve found yourself a perfect family vacation destination. Not only does San Marcos, Texas, have all these ingredients, it's also very affordable. This Hill Country town is a fantastic and unique place for your next family getaway for the same reasons Business Insider ranked it as one of the "Best Places to Raise Your Kids." Sure, these days you can stand-up paddleboard on almost any river, lake or ocean. And, yes, some locations even have nighttime paddleboarding. But how many places combine nighttime paddle boarding and glow-in-the-dark fun? San Marcos might be the only one. When you book a SUP Glow Night Tour at Paddle SMTX, you can rent a board equipped with one of seven colorful LED lights. Known as one of the coolest experiences in Central Texas, the 90-minute paddle lets you practice your balancing skills, enjoy the beautiful scenery while leaving a glowing colorful stream in your wake. Experience the United States’ military history in the air as you take to the skies in a 1943 B-25 Yellow Rose bomber. The legendary Doolittle Raiders flew the Yellow Rose to bomb Japan after the attack on Pearl Harbor. Today up to seven passengers can take a 30-minute flight on the plane at the Commemorative Air Force Central Texas Wing. During the trip, passengers are encouraged to experience aircraft positions such as Tail Gunner and Bombardier. Learning about World War II history has never been so fun. The historical museum also has old warplanes and other collective memorabilia on display. 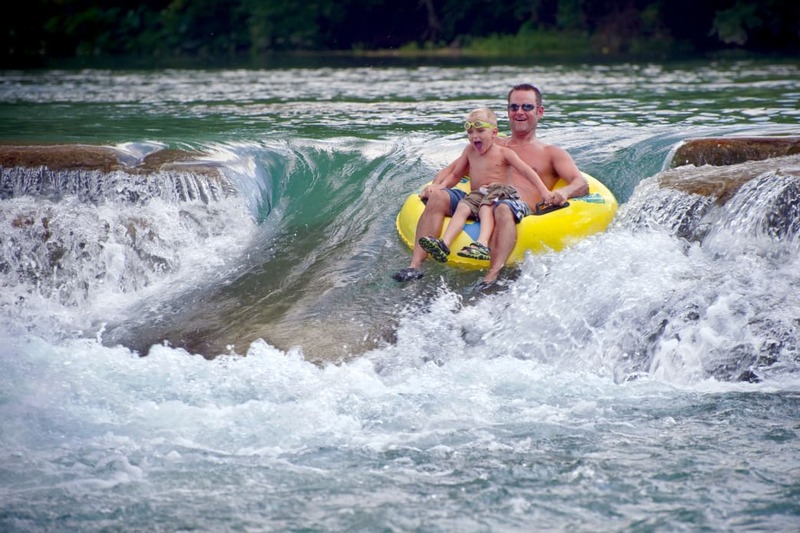 San Marcos is perhaps best known as a tubing destination, and the San Marcos River, with a year-round water temperature of 72 degrees, doesn’t disappoint. Nothing wears kids out faster than playing in the water, which is one of the reasons why parents love the spring-fed river that runs through the heart of San Marcos. But it is not just young kids who enjoy the river. From laid-back grandparents to the adventurous teenager, the river offers activities for all age groups and energy levels. Want to plunge down rapids in a kayak? Visit the Rio Vista Park for some whitewater fun. Want to slowly float down the river while perfecting your tan? Put your tube in at City Park and float downstream. Want to check out sunfish, blue tilapia and red-eared slider turtles in crystal clear water? Head to Snorkel TX for some snorkeling. If you’d rather enjoy the scenic San Marcos River from a cool spot on the grass, Children’s Park is a great option. There’s plenty of space for Frisbee or other games, plus a play structure for kids with a poured-rubber safety surface. If you do not have snorkel gear, tubes, kayaks, or whatever else you need to enjoy the day on the river, several nearby outfitters are happy to rent you all the equipment you need. As a bonus, the spring-fed river is a constant 72-degrees, which means it is refreshing year-round. Head to Wonder World Park to explore the only earthquake-formed cave available to tour in America. Guides lead families deep into the Balcones Fault Line Cave. Wind your way along the cave tour while checking out fossilized prehistoric life embedded in the strata formations and the huge boulders suspended in midair. The underground cave maintains a cool year-round temperature, which makes it a perfect summertime outing. After the cave tour, stick around to enjoy the park’s other quirky attractions like an anti-gravity house, the Tejas Observatory Tower, or the Texas Wildlife Petting Park. The Glass-Bottom Boats at The Meadows Center for Water and the Environment are a fun way to explore Spring Lake. Hop aboard a historic Glass-Bottom Boat and watch a lake being formed under your feet. 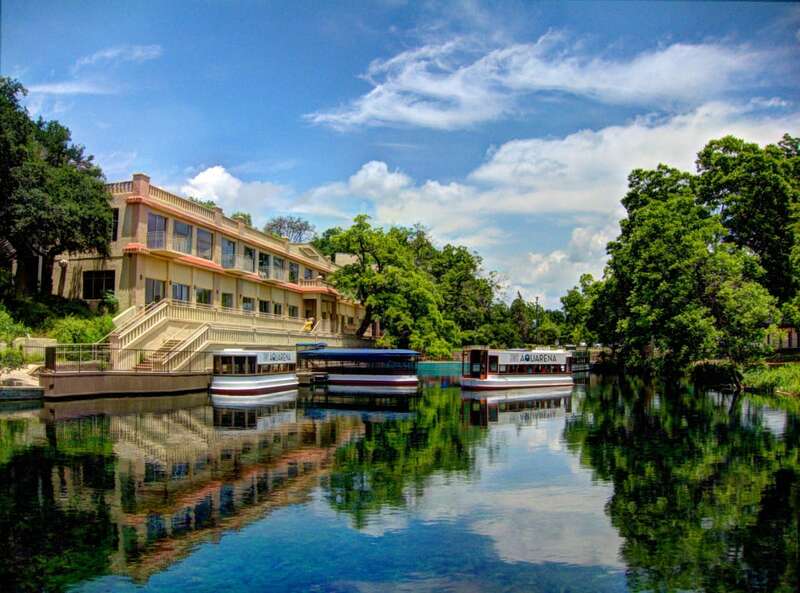 A series of more than 200 springs continuously bubble up to form Spring Lake in San Marcos. It is said that if the lake were emptied, the underground springs would fill it back up in 8 to 12 minutes. The Meadows Center for Water and the Environment offers 30-minute tours of Spring Lake on a Glass-Bottom Boat, where riders can see through clear water as the sandy lake bottom bubbles up. Tour guides point out the plants and fish along the way while explaining the history of the lake and the area. It is a truly unique and educational experience. Public art is all around San Marcos. See how many of the wall-sized murals you can find. The City of San Marcos Mural Arts Program has commissioned artists to paint fun, colorful murals on the sides of buildings around town. Take a picture of the kids in front of the wall-sized, blue mermaid mural at Root Cellar Cafe and Brewery or a family picture in front of the Greetings from San Marcos (78666) mural that looks like a vintage postcard. They’re harder to find, but mini-murals also dot the downtown landscape. Can your kids find the Cupig, a tiny pink pig armed with a heart bow down Kissing Alley? Written by Jennifer Simonson for RootsRated Media in partnership with San Marcos CVB.